When buying pearls there are a number of important things to keep in mind. Luster is that glow of the pearl which emanates and which gives it's brilliance to the eye. The longer the pearl is in the oyster the bigger it may grow of course but also the deeper and the higher the luster. Placing an inferior and a superior pearl side by side it is very easy to tell the difference by the luster. Luster is the glow of the pearl and its brilliance to the human eye. The longer the pearl is left in the oyster to grow its nacre casing, the higher the luster. This is the sheen, the shine, the brilliance and the reflection of light on the surface of the pearl. The deeper and more nacre the pearl contains the deeper the surface luster and the more reflective qualities the pearl has. There is no mistaking a quality pearl with a high luster. The surface condition is also important. 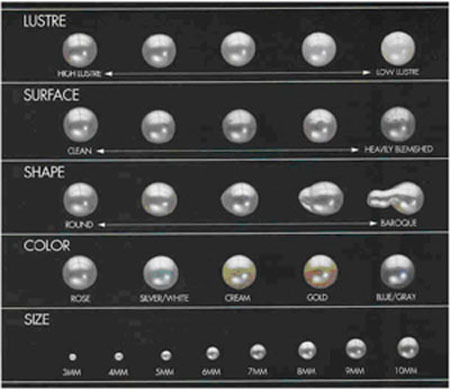 the more markings and spots on the surface of the pearl the lower the quality and value. A good quality pearl should have little or no imperfections at all on the surface. The best pearls are those that are perfectly round and perfectly round cultured pearls are the most rare. Although most cultured pearls are nearly round, only about 1% are perfectly spherical. You can tell if a pearl is perfectly round. By the way it rolls. If it veers to one side it is not perfectly round. The shape will be found by how much it veers to one side. If you get a row of pearls in a necklace say, roll the necklace on a flat smooth surface and see how it rolls. Any pearls not round will be immediately obvious. Other shapes include, semi round, off round and drop pearls. There are also ringed, button, Stick, elongated (from fresh water oysters), angel-winged and some others. Pearls are available in different natural colors, Color consistency also effects value and price of the pearls, as do current fashion trends and color demand conditions. It is important when assembling pearls for a necklace or piece of jewellery to pay special attention to assure that the color consistency of all the pearls on any given piece is the same. Pearl diameter is measured in millimeters. Generally, the larger the pearl, the rarer and the more valuable it is. Pearls can range from 6mm to over 20 mm and more. 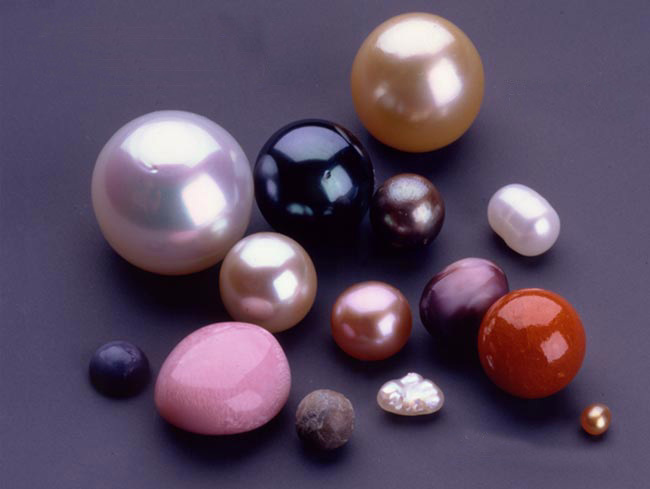 Because pearls are not cut or polished when removed from the oyster or mussel, certain sizes, qualities and colors may from time to time be in scarce supply. Overall health of pearl growing oysters and mussels effect pearl size, quality and availability.